There is an elderly and ailing plum tree in the chicken’s enclosure, One branch that is reachable makes nice plums, but much of it is rotten, unreachable, or full of the debris of creepers grown up from what was the wilderness next door. But it makes seedlings prolifically. In a ‘normal’ garden the seedlings wouldn’t survive as they’d mostly get mowed down with the grass, but since we have had the chickens in there they have scratched out every bit of grass and almost everything else, except bluebells, daffodils and stinging nettles. And the occasional seedling survives having its leaves pecked off until it is big enough to grow to a height where it doesn’t matter. I left some of them because it’s nice to have something growing where the chickens are… for the same reason I don’t have bonfires anymore – any substantial tree branch gets dumped in with the chickens and it allows a bit of greenery to grow up (mostly nettles but I am retrieving some grass sometimes too), and it gives the chickens something to perch on while they investigate edible stuff beneath the branches. Then I decided if we were going to have weeds growing tree-sized we might as well have nicely pruned weeds, and then I also started festooning the branches. 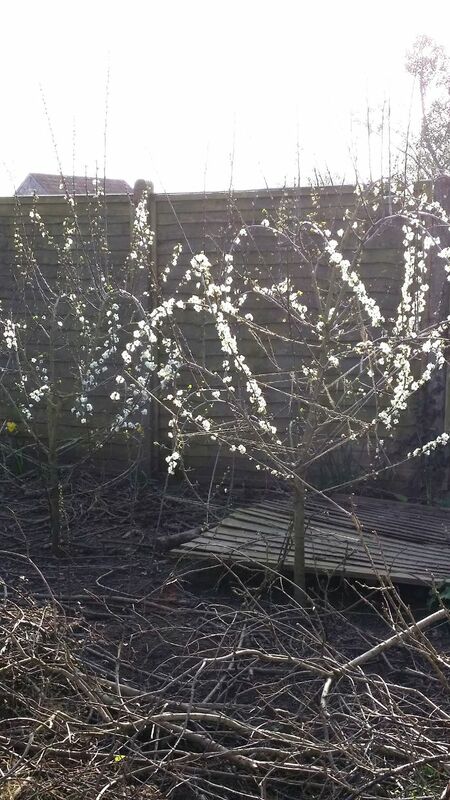 This is a technique that works on apple trees, I don’t know if it works on plums, but it’s an experiment with weeds, so worth a go. Simply, you tie the branches down when they are bendy, and this encourages the branch to fruit earlier in its life, and in fruiting earlier I also hope it will slow the growth of the trees. 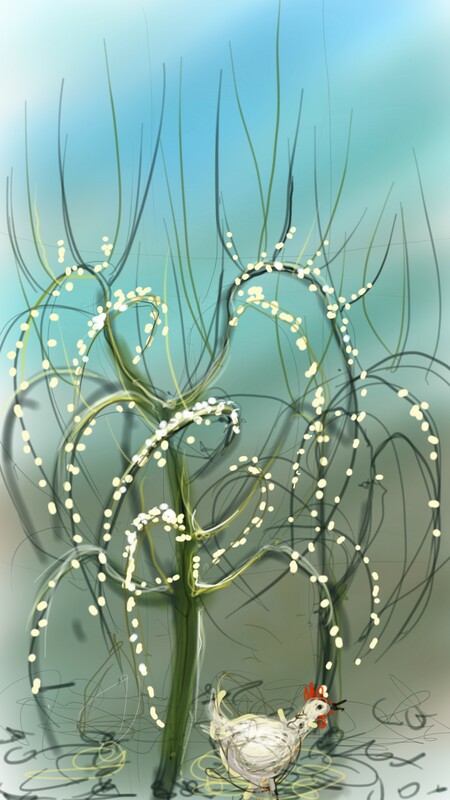 This entry was posted in Plants and tagged art, chicken, digital sketch, drawing, festooned trees, illustration, plum tree, samsung galaxy note 3, tablet sketch, tree on March 30, 2014 by Nancy Farmer.